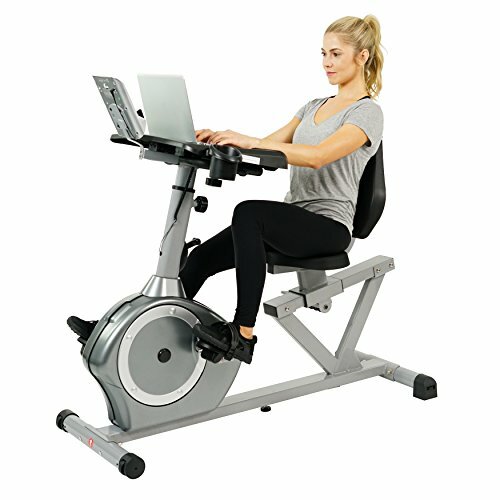 In this post, I'll review some of the best desk exercise bikes you need to consider for healthy living amidst your busy working schedule. Anyone who needs to stay fit has to maintain maximum workout hours, and it surely doesn’t come handy. You need to be more focused towards your health to maintain your physique. The problem double up when you are in 9 to 5 sitting jobs. You hardly get to move from your place the entire day, and at the end of the day, you might not actually have any time for yourself. In such scenario, the best option that you are left with is getting into short and light exercise in the middle of your workout routine. Keeping your health in mind, companies have been coming up with new inventions and machines. One such invention that we praise is desk bike. Provided that you are having issues in maintaining the gym hours, the desk exercise bikes come as a quick blessing for your health. Replace your office chair with it and you can spend the entire day working and still managing a perfect metabolism level. But, before you stop at one of the vendors or online sites for ordering your equipment, we would recommend you to understand the attributes of the desk cycles and what makes them the perfect choice for you. Let’s start without much ado. Easy setup and use: The first thing that you need to look for in your desk bike is – it should be highly comfortable regarding installation. You will surely don’t like to engage in hours of assembling just to start your work. Look for desk bikes that are cordless and needs the least maintenance. We also recommend designs that easily get mixed in home, classrooms, and workspace. Comfort and convenience: Second thing on our list will be looking for a comfortable seat. If you are planning to sit on that chair for hours, it is imperative for you to have an adjustable seat. Pedal motion: It is best if the bike pedals in the both directions, backward and forward. This makes sure you can work on different groups of muscles. Durability: Durability is a must to look for when you are buying an exercise machine. It is going to wear your body load for long and for this you need a sturdy built. The Monitor: Your monitor will show you or say guide you about your health. Some of the functions it displays are speed, time, distance, and burnt calories. Make sure that the positioning of the monitor is in a way that it’s visible to you easily. Build and Design: FitDesk 2.0 has maintained the heritage of Bike Desk with its sturdy and reliable manufacturing. This one is certainly one of those options that we were trying to get our hands on. If you are looking for a short duration and high-intensity exercise bike, then FitDesk would be our first recommendation. You will get this desk bike in a partially wrapped packet, which would require just a few minutes of assembling. The bike is delivered with some of the tools needed for assembly, but we would recommend you to have your own set of screwdrivers. When we talk about its aesthetic, it’s a subtly built bike with the dimension of 28*16*45. With this dimension, it doesn’t seem to occupy much of the office space. Look at it from far, and you will find it a little flimsy. Comfortable: It’s a reliable machine that will give you a solid pedaling experience. The manufacturing has been done by keeping in mind users of at least 250 pounds. To take it from one place to another, you can simply fold it or drag it. As it's not so big in size, there won’t be much trouble in setting it up in your workspace. 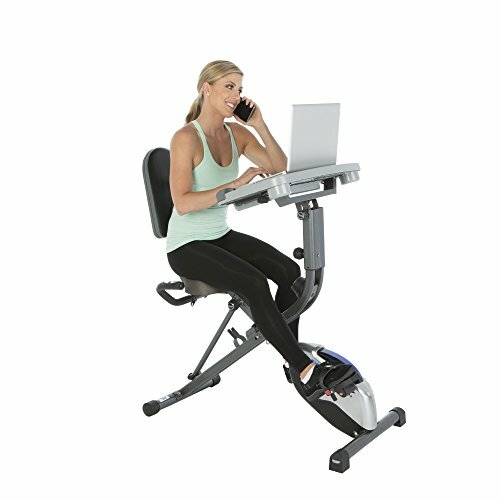 FiT Desk is known for giving an adequate range of motion for your legs, which are appreciated when you are looking forward to keeping yourself active. However, it is the seat padding that we don’t like. Even though it is plush padded, we have heard that the users struggle with the seats. Also, if you are not into multitasking, we would recommend you to take only the lighter jobs while paddling. Build and Design: Exerpeutic WORKFIT 1000 bike desk is the only bike counter, which is equally bike and desk. Those who use it assume it right for short as well as long duration tasks like checking emails in the morning or after returning to home or watching TV or reading books, while still engaging your muscles. 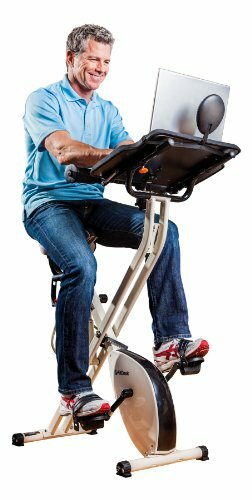 A large, fully adjustable desktop is attached to the desk bike which makes it possible for you to adjust the position while sitting and standing. In total there are three angle adjustments and five height adjustment with this bike. To make typing on the laptop easier, it comes with a durable armrest. Being not too bulky it won't even look odd in the workspace, and when you are traveling you can just fold it up. Performance: Long work hours are supported with this desk bike. As the seat wears the structure of a chair, you can sit comfortably while paddling and working simultaneously. Level magnetic tension control system comes with this bike, and you can always adjust it depending on the type of work you are into. We prefer high speed when the work needs less attention and slow speed when there is an urgent task on the desk. We usually find it good when it comes to both mental and muscular strength. For those looking for overall well-being, we surely recommend this desk bike. Build and Design: The next on our list is Sunny Health & Fitness, suitable for those who are actually finding it difficult to engage their body muscles. As per the manufacturing is concerned, it is sturdily built, yet the company maintains its portability. You can disassemble it down to carry while you are traveling. Heavy duty steel building ensures the stability and durability of the machine. 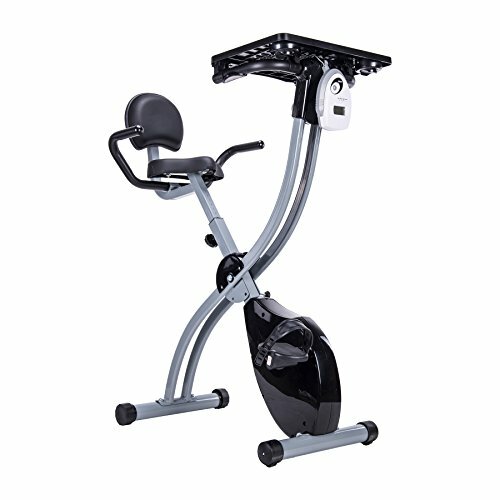 Performance: Supporting approximately 150 pounds, this bike is considered suitable for cycling, aerobic exercises, physiotherapy as well as muscle strengthening. The amazing part about this bike is that it also accumulates an aesthetic working pad that holds your laptop smoothly. It allows you to engage in a moderate amount of exercise without interrupting your work schedules. The LCD attached to it lets you detect the amount of calorie burnt, speed, workout time, rotation per minute, and scan. To make the exercise most versatile, the bike comes with a tension that can be adjusted to make a shift in the work resistance. Plus the anti-slip rubber pedal ensures your legs are at the right place. Both men and women can bring this under use as it easily supports the weight of 150 pounds. Build and Design: It’s a heavy duty desk bike that also allows you to work while peddling. A large and secure tabletop space for your laptop is given, where you can position your laptop. Easy to setup, this will come in a disassembled way and will take hardly few minutes to assemble. When you are shifting or traveling, you can disassemble it, making it fit into a small space. Performance: If you are looking for an ergonomic and convenient desk bike, then here you have a perfect choice. The comfortable design of this bike helps your wrist rest while typing and comfortably engage you in long work hours. Because you will be focusing on your job as well as pedaling there will be no chance of getting distracted by any third element. The seats are fully adjustable from four sides, so you are not going to feel like you have been seated on an exercise bike for long hours. For all day comfort, the seats are fitted with large cushions. The self-leveling foot pedals are easy to put your feet into, plus there won't be any case of slipping because of the foot straps fitted tightly. To monitor your performance there is an LCD which will give you a count of distance, calories, time, speed, and, odometer. Build and design: Don’t expect it to work like the treadmill desk, but what you get with this bike desk is good enough for health benefits. Seating at this desk bike, you can do small work gigs like emailing and checking your messages and little browsing here and there. We won’t recommend doing attentive work on this desk bike as it might get difficult to sit on it for long hours. The upgraded aluminum flywheel gave impressive noise reduction feature and that makes it perfect for you to use it in the workspace, without annoying the people around you. It has been tested for almost 1 million rounds for 40 continuous days and that makes it perfectly durable. For traveling purpose you can fully fold it and put in your truck. We find it perfect from every aspect, be it durability or portability. Performance: Well-built mechanically, this desk bike has the most comfortable seats for short duration. You can happily use it while watching. You also get a rear USB port for charging your devices like iPod and cell phone while working. It has eight resistance setting that makes it easier for you to pedal. Plus, it comes with a robust cycling mechanism and non-slip desk surface. The belt makes it easy for you to secure the laptop in place so that you can work for long hours without worrying about your devices. This was our list of Desk Exercise Bikes. All of them have been tested for high performance and can persuade you to work out for long hours. Those who have used them consider them as a life changer. Within a short period, you will start noticing flexible and strengthen muscles. We would also like to hear about the desk exercise bikes you use. Enlighten our users by sharing your views.